2017 State of UniPro — UniPro | Pilipino American Unity for Progress, Inc. In our New York chapter, community organizing came to the forefront of our efforts. The chapter started off the year in deep collaboration with FADCNY, Anakbayan NY, Anakbayan NJ, Philippine Forum, NaFFAA, NAFCON, and the Queens Anti-Gentrification Project to defend Woodside (a.k.a. Little Manila), from what would have been an opening salvo in the gentrification of the neighborhood. In March, we hosted a Know Your Rights workshop, in partnership with the International Filipino Association of New York University, with a panel of great speakers from diverse backgrounds, and Kalaya’an Mendoza of Amnesty International as the keynote speaker. In June, we co-sponsored a Know Your Rights Townhall with the Filipino American Lawyers Association of New York, with Define American’s Jose Antonio Vargas as the featured speaker. Through our membership in the APAVOICE Coalition, UniPro co-sponsored a candidate forum for Queens’ District 20, and reached out to over 2,000 voters through phone banking for the elections in November. Our collaborative relationship with the Philippine Consulate continued this year, as invitees to the General Assembly in March, hosting the Philippine Graduation Ceremony in June, and co-sponsoring the Sinehan sa Summer film festival in August. After a year away from New York, Summit was back in New York City in June, with this year’s theme being “Persist.” Dialogue during the conference ranged from addressing the political climate that we have been facing to professional development for young professionals, and realizing how we can collaborate to move our community forward, together. During Filipino American History Month, we sponsored the New York Jets’ Heritage day and the New York Knicks’ Philippine Community Night. UniPro also hosted a community happy hour and raised money for Mosaic Minds, a magazine founded by a New York City-based Filipino American. In our work with students, we were excited to once again hold a workshop at the Filipino Intercollegiate Networking Dialogue’s (FIND, Inc.) 2017 Spring Dialogue at Pace University, and hosted The 2017 Opportunity Fair at New York University to provide professional networking tips and mentorship for emerging professionals. Southern California has provided many opportunities for UniPro to organize for our community and advocate for our community. We joined rallies to defend DACA recipients in the wake of the DACA repeal, and joined the city’s Rally Against Hate. For students, we continued our work in providing guidance and education to the youth by giving workshops to various audiences throughout the year to pass down our history and culture to the future of our community. UniPro continues to be involved in “Save PQ Village” campaign to advocate for affordable housing and support the community. In the Midwest, our chapter has grown significantly and our work has grown alongside our team. 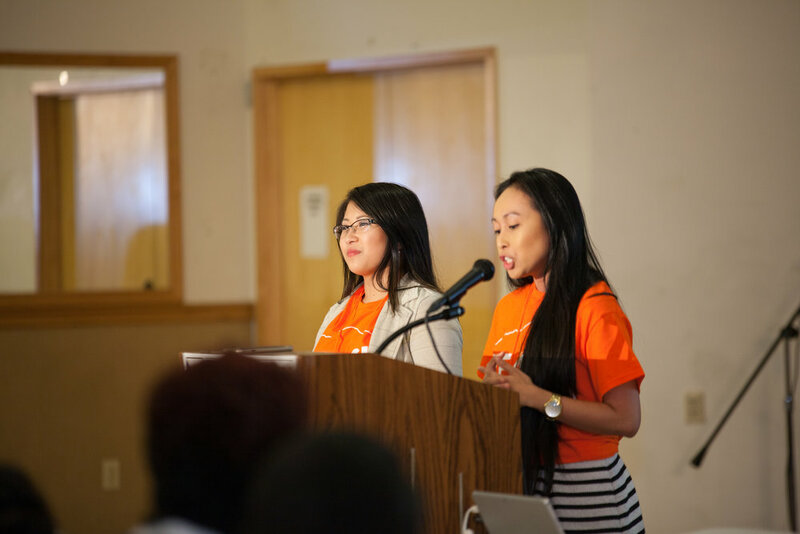 We’ve touched hundreds of community members across generations by giving workshops at the Midwest Filipino American Summit at Marquette University, hosting representatives from three of our chapters to present a workshop at the Filipino Americans Coming Together Conference, and hosting an intergenerational dialogue during the Summer to share our stories as we look to the future. With our partners, we were able to bring together our community around food and fun with Filipino Kitchen for two kamayan nights in Chicago, and co-sponsoring FAHRA’s Human Rights Day. Our bonds to our community partners have grown stronger over the past year, and we’re excited to continue working with them in the future. The Pacific Northwest hosted our 2016 Summit, and our chapter has been working on transforming momentum into action. Earlier this year, the chapter hosted a meet and greet for Filipino young professionals to form the bonds in our community among students and recent alumni and provide opportunities for mentorship, professional development, and sowing the seeds for opportunities to create an impact in the strong Filipino American community in Seattle. Our newest chapter officially launched in September, but we’ve been working hard in the South to create impact throughout 2017. Working with the collegiate community, we held Baon, a conference held in conjunction with the Southern Intercollegiate Filipino Alliance, and held our Kilusan workshops to share history and culture with student leaders in Texas. We’ve been fortunate to have such a close relationship with the Filipino American National Historical Society (FANHS), working with them to host a storytelling merienda, forming a partnership to host Yana Gilbuena for a kamayan brunch, and traveling together for the Bataan Memorial Death March in New Mexico. Of course, in September, Hurricane Harvey struck the Houston area and changed many lives - but in the face of tragedy, our chapter worked with our larger community to volunteer, raise money, and organize to show what #HoustonStrong is all about. Grace Lee Boggs once said “History is not the past. It is the stories we tell about the past. How we tell these stories - triumphantly or self-critically, metaphysically or dialectally - has a lot to do with whether we cut short or advance our evolution as human beings.” As we look back on the year, let us be reminded of what we accomplished but also the work that remains. There remain relationships to be built, and some repaired, ideas to execute and leaders to unleash. Pilipino American Unity for Progress, Inc. (UniPro) is a volunteer-run 501(c)(3) nonprofit organization and operates on a budget of donations, grants and money raised through fundraisers. Please consider contributing to our efforts by contributing to our end-of-year Season of Giving fundraiser. Your donations are tax deductible.